Every single day, highly intelligent, highly motivated high achievers are breaking down. These high achievers have skilfully adapted to turn a blind eye to their physical and mental wellbeing. Often unconscious decisions, and “unconscious drivers” (ancient familial emotional templates) which have led them to success are secretly hurtling them towards complete breakdown. We carry on regardless because of fear of humiliation, fear of making a stand, and, ironically, fear of weakening. Fear is not a long-term motivator. Fear will cause us to avoid taking care, will perpetuate stress, and will cause worsening mental health – caused due to the persistent release of adrenaline and cortisol – creating a highly stressed “de-humanised” state. I believe that the individuals who are breaking under this pressure of “de-humanisation” are the very people you actually need at the heart of business; those who have hearts and souls, and who have cared enough to give their all until they couldn’t anymore. Our “carry on regardless culture” has led to many traumatic breakdowns being misdiagnosed as burnout. High achievers are particularly susceptible to this as they are familiar with living in a state of high pressure. Our high achievers are used to living at the very limits of their physical and mental health. While that is within the realms of “normal” for short bursts of time, it is not a state within which one can reside for long and get away with it. Living on this knife-edge often comes with a delusion that there is no other way. I support many in reassessing this myth, but for those already broken down, this can take months and years. It is vital that these high achievers can extend themselves within a powerful role whilst cultivating a relationship with themselves that is kind and nurturing; anything else carries too high a risk. Perpetuating these myths is expensive. Rewarding denial of basic human needs, and not valuing self-care, is breaking people. This is not a sophisticated way of operating. Ignorance of the care of the inner self is leading to anxiety, depression, substance misuse, trauma and sometimes, complete breakdown. “Starvation of the self” in order to elicit super human hours, inhumane diets, and poor physical and mental health is not sustainable. If we perpetuate desperation and not contentment in the work place, we reward the very mindsets and behaviours that are causing an insidious sickness. This pervasive culture is dangerously archaic. The antidote to this is passion and kindness from the top down; CEOs, managers and HR practitioners should demonstrate sophisticated self-consideration and care, and encourage employee engagement – this is almost a Health & Wellbeing Policy in action. 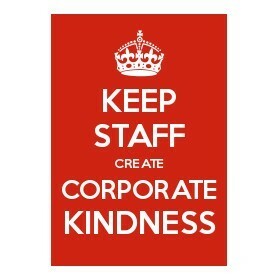 If you make kindness core, you keep your staff happy and well. Corporate kindness is a “top down” must, where the meeting of basic human needs leads the way to a healthy and happy workforce. To do the opposite, you crush the very creativity you have chosen to employ. Prevention is always best, and well-respected companies like the Alexander Associates Group are acknowledging this and the effects of stress in the workplace. In July this year, they launched the Wealth Medical, a comprehensive assessment of your financial wellbeing. This is coupled with the option of a same-day supplementary health check at the Wellington Hospital in London, to provide a holistic, 360 view of your financial and physical health. It was launched in response to a recent study by The Mental House Foundation which revealed over 50 percent of British adults attribute money and work worries as the main causes of stress. The most intelligent minds are often numb to the basic need for things to sustain them, but those same intelligent minds must be employed to spread corporate kindness and end the silent brutality of stress before it is too late. Look to enlightened CEOs who are shining a light on how you get the best from your employees whilst maintaining a human connection and allowing their basic human needs. Make a shift to human experience being at the centre of the corporation. It is not easy in this climate – it takes courage. It takes consistent conviction for a CEO to make a stand, but it is within our best minds that this sophisticated shift must take place. Anna Pinkerton BAHons PGDip DipPW TIRCouns EMDRII MBACP HCPC is a Therapist, Coach, Speaker, and Author of How to Smile Again: Recovery for those in public life but in private pain. Anna is the founder of Kindness for Corporates©: For the enlightened & courageous. She offers corporations exclusive Kindness Consultation for a sophisticated shift against brutality towards kindness and continued success. See more at www.annapinkerton.com.